SRINAGAR, Indian-controlled Kashmir (CNN) -- Shops and businesses sat idle on Wednesday, while paramilitary forces patrolled the empty streets of Srinagar a day before the latest round of Indian parliamentary elections. 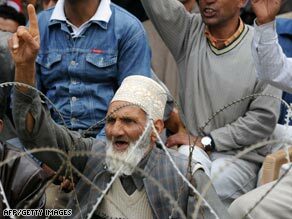 A Kashmiri man, sitting behind a barbed wire fence, gestures during an election rally in Srinagar. The security clampdown is an attempt to prevent more anti-election protests in Srinagar, Kashmir's summer capital. Ten people -- including one policeman -- sustained injuries on Tuesday evening when protesters clashed with Indian paramilitary forces and local police on the streets of Srinagar's old city. Indian paramilitary forces and police dotted the entire city on Wednesday, barricading intersections from pedestrians and vehicles. Srinagar is the central flashpoint of Kashmir's separatist revolt. It is one of eight Indian states and boroughs that will cast ballots in Thursday's parliamentary elections. Hardline separatist leader Syed Ali Shah Geelani has called for a two-day boycott against the election. "By observing the strike against the elections, people can register their protests," he said. Last week, separatist groups called on Kashmiris to boycott the polls in Anantnag, which led to a significant drop in voter turnout. Only 26 percent of voters cast their ballots in Anantnag, a drastic drop from turnout in state assembly polls in December. Fearing more violent protests in Srinagar on Wednesday, authorities began moving in paramilitary and police reinforcements in the early hours to deter demonstrations. Security forces were not allowing any movement on the streets of Srinagar's old city, residents said. Across the entire city, shops and businesses remained closed and government employees stayed home despite a directive that they show up for work. Nearly all leaders of Kashmir's separatist movement have been placed under house arrest over the past week to prevent them from rallying people to protest the elections. There are 15 candidates vying for seats to represent Srinagar in India's parliament, although a direct contest is expected between the two candidates representing the National Conference (NC) Congress coalition and the opposition People's Democratic Party (PDP). The NC Congress coalition has fielded a high profile candidate, Kashmir's former chief minister, Dr. Farooq Abdullah. Various rights groups and non-governmental organizations here, however, dispute the official statistics -- claiming that the number killed during the last two decades is twice the official figure.